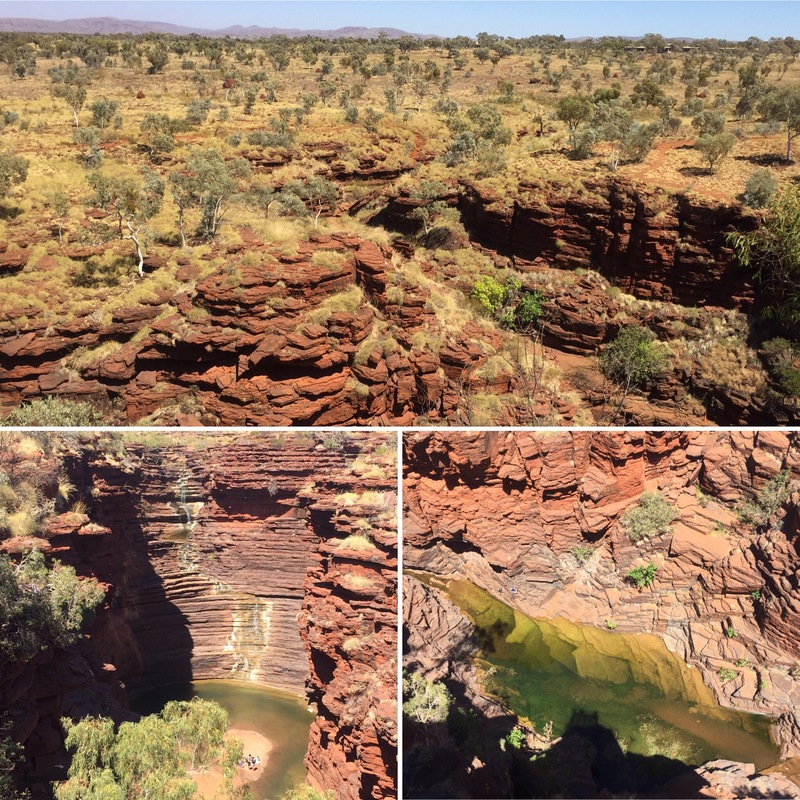 On Thursday 28th September, we left our camp in Port Hedland (after having driven a full day from Broome) to head into the Karijini National Park. 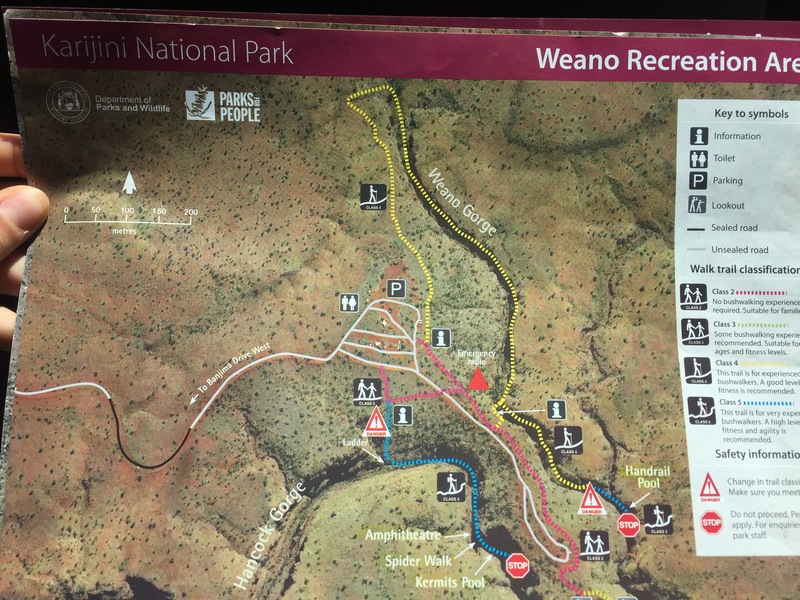 This is one of the biggest national parks in Australia and we had heard good things about it so we were really looking forward to spending a few nights here exploring. 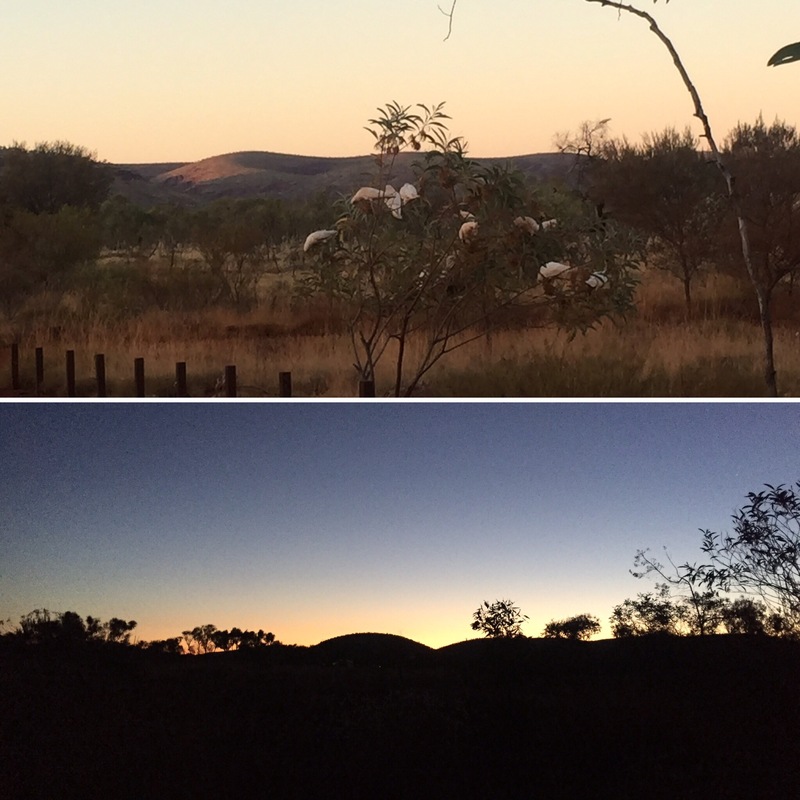 We arrived around 1pm so had a few hours before the sun would start setting to see a little bit of the national park. 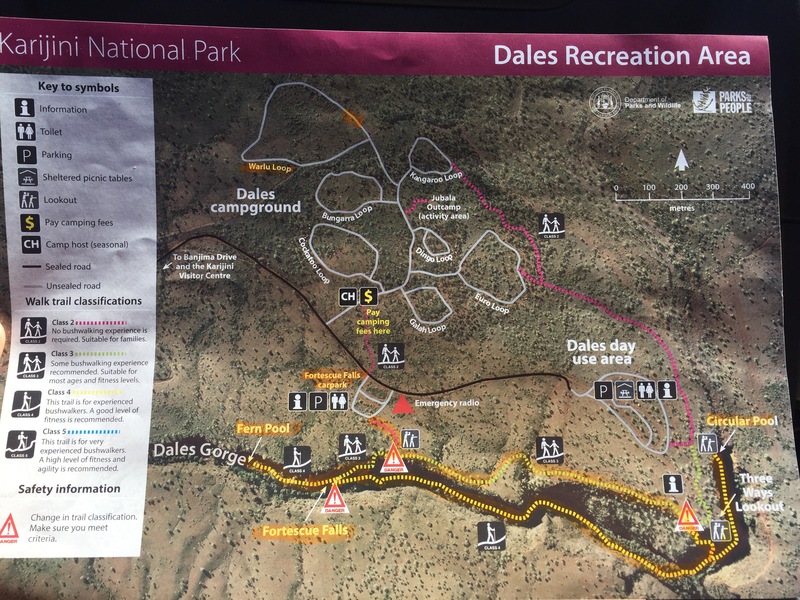 We would be staying in the Dales Gorge campground during our time in the national park as this was the cheaper of the two available campsites (at $11 each per night). After having lunch, we headed to w which is a beautiful waterfall set into the edge of the gorge. The rock making up the gorge is layered and looks a bit like someone has just stacked some pretty patio tiles on top of one another. 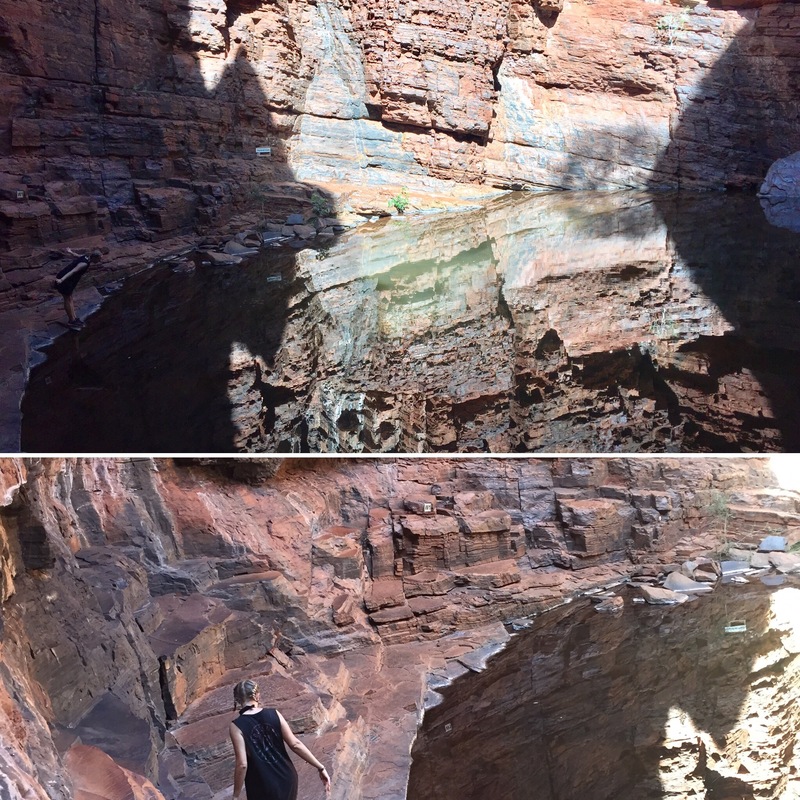 The water falls over this rock into a beautiful deep-turquoise pool. 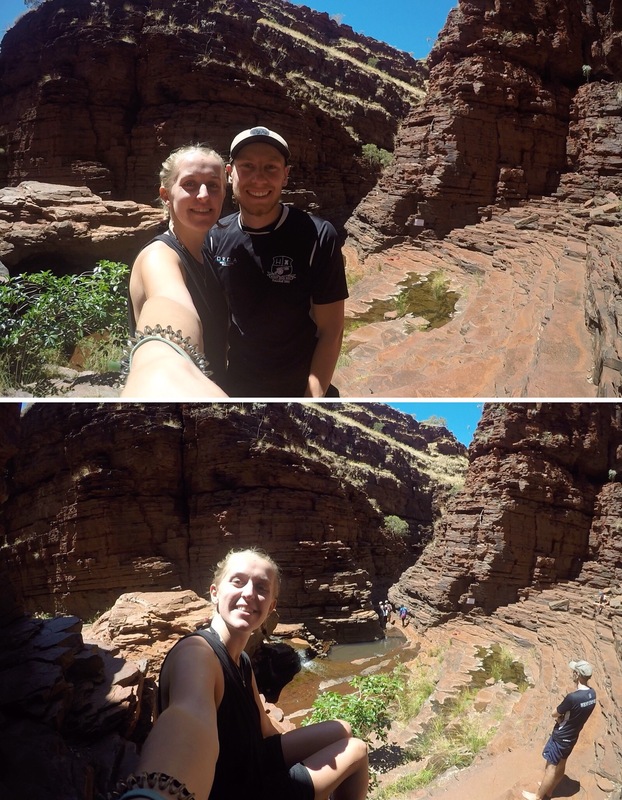 You walked down some steps into the gorge itself – giving some fantastic views along the way of the gorge floor and of the waterfall. 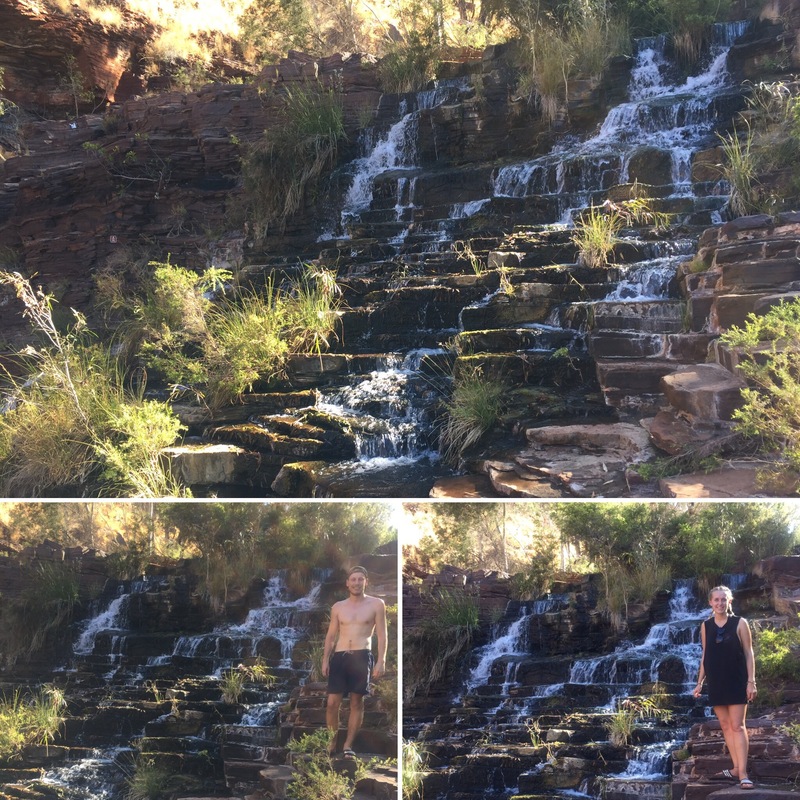 You then have to walk over the rocks which have created natural steps into the side of the waterfall that take you further down to the pool where you’re able to swim (we were out of crocodile country now!) and get right up to the waterfall. The water was really cold but we braved it and after a while you got used to the temperature. The pool had a lot of areas where we could stand in which was great as it meant we could stay in the water for longer without getting tired. 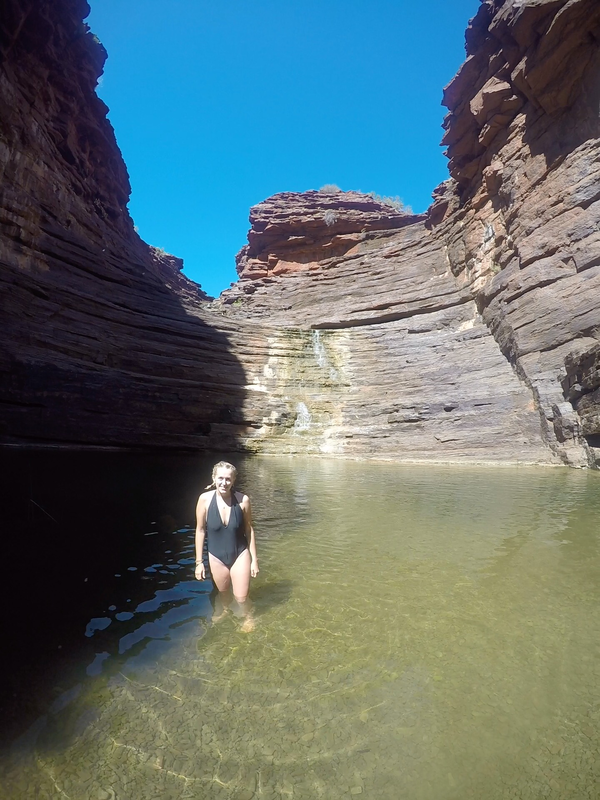 Swimming surrounded by the beautiful layers of rocks that tower over you is incredible and I don’t think either of us got tired of just looking at our surroundings. Along from the falls is another pool known as Fern Pool which is equally as pretty. This is surrounded by trees and whilst we were there a lot of cockatoos were flying around and nesting in the trees which made the whole area feel even more tropical and remote. This pool was a lot deeper than the last and I kept laughing which made swimming very difficult so we didn’t stay in there as long. We could have sat by the water for hours looking out over the pool had it not been getting late (we always have to make sure we’re back a bit before dark to set up camp and cook whilst there is still some daylight around). We had an allocated spot at camp which was really handy seeing as our ‘tent’ was the car and so it meant we didn’t have to worry about losing our space for the night. The nights had got a lot cooler (still not by UK standards) and there was a lot more wind in the national park as it was pretty flat (aside from the gorges) so we experienced our first cold night during our trip! It definitely beats going to sleep in a sauna and we were even spending more of the evening in the car instead of in camp chairs looking at the stars. 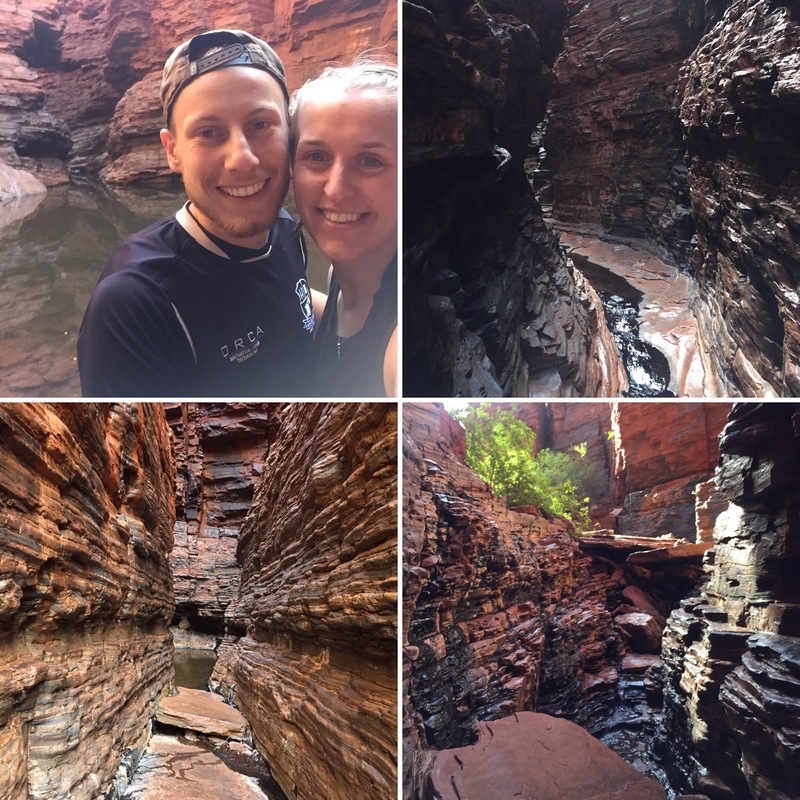 On our first full day in the Karijini, we would be walking through and above the Dales Gorge that houses the Fortescue Falls that we had visited the day before. 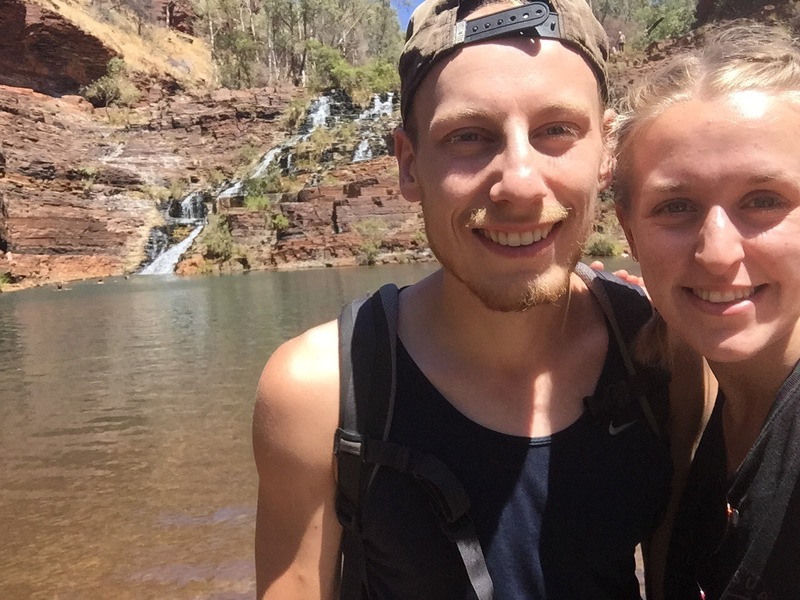 We started by sunbathing next to the falls as we wanted to soak up as much time there as we could. It was nice to have the day to relax and enjoy our surroundings and we gave ourselves plenty of time to see everything we wanted to see. 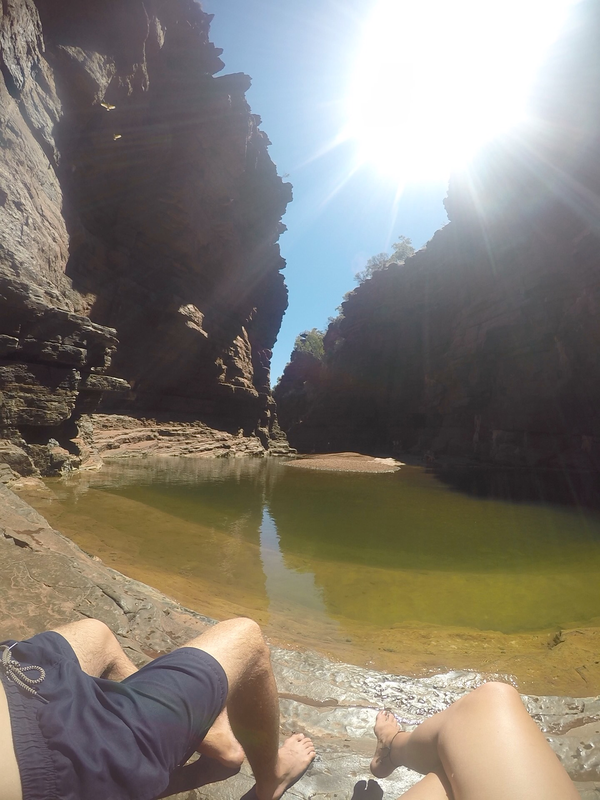 We then walked into the gorge. 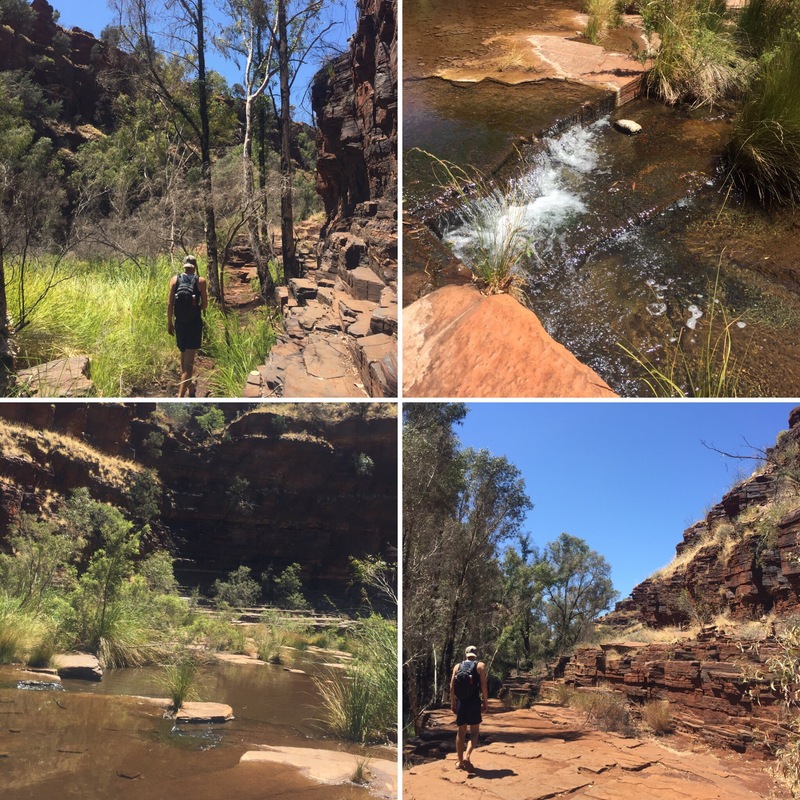 This took us along the river that flowed out from the waterfall pool and all the way along the gorge to another pool called Circular Pool at the other end. The walk was said to be reasonably challenging but there were only a few bits where you’d need to cross over some water or clamber through some rocks so it was all manageable. 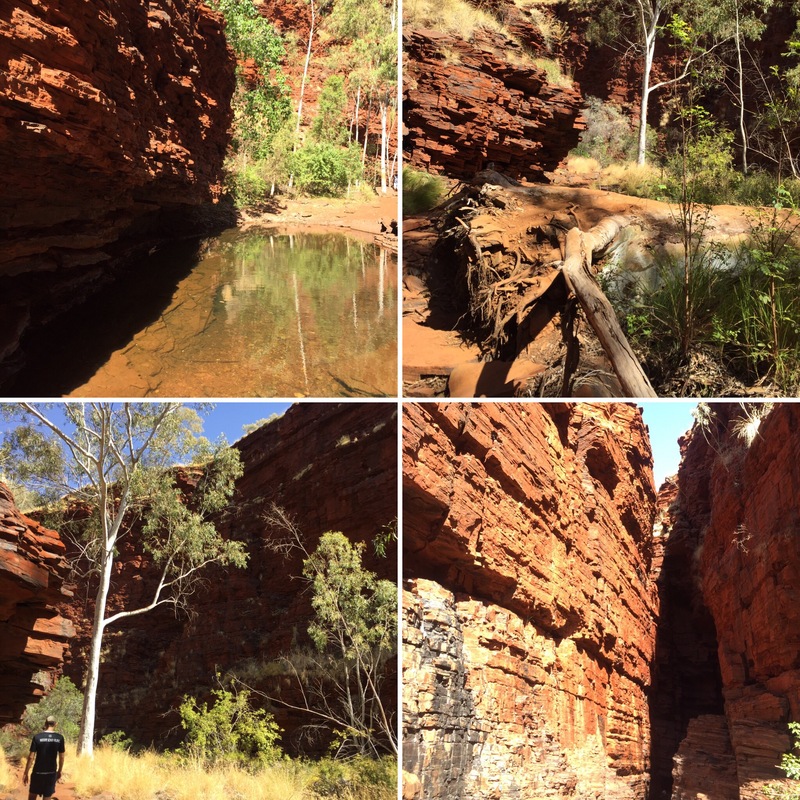 The gorge floor is full of ferns, trees and flowers and it is an amazing place to walk through. I couldn’t have imagined it to be as pretty as it was and we made sure to stop often and enjoy where we were. 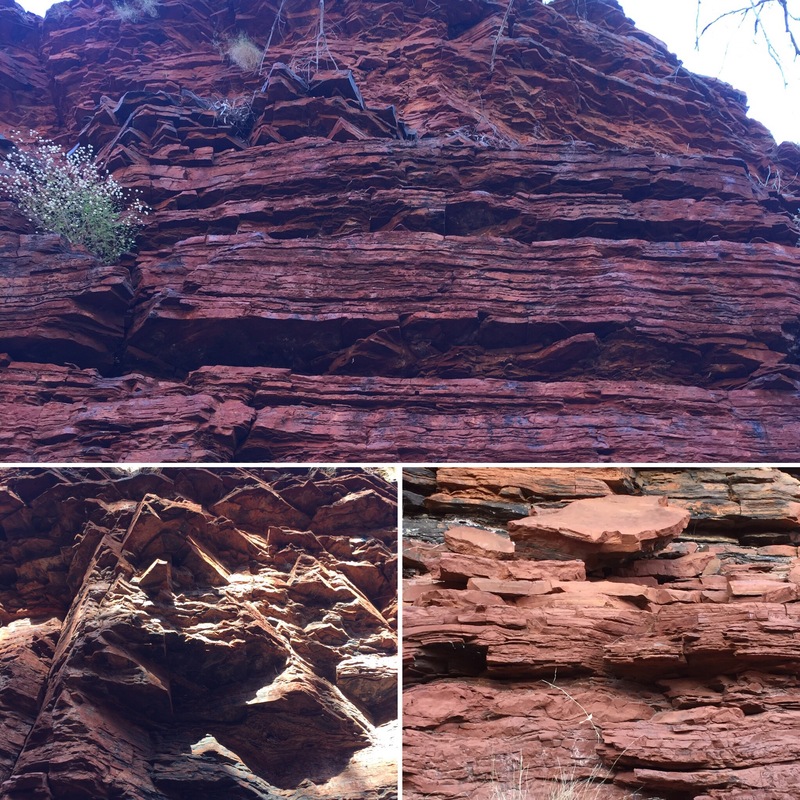 It was also incredible to look up and see the gorge walls towering over us. 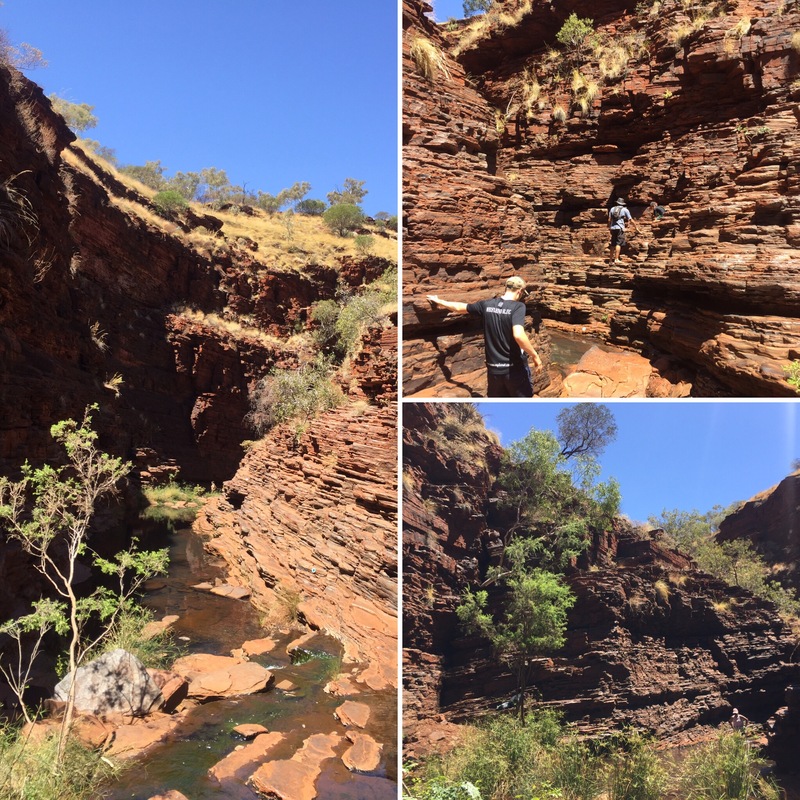 Along the route were the odd waterfall, areas of dense trees and then wide, open, flat slabs of rock that reminded you just how big the gorge was. 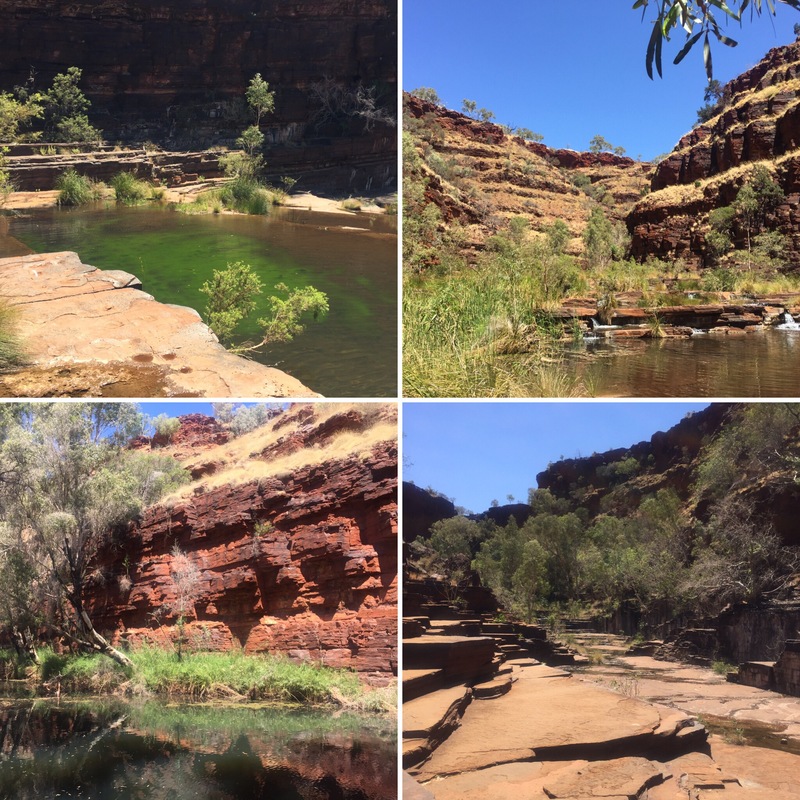 Before we would be walking back up along the outer ridge of the gorge, we headed to the end of the gorge to the Circular Pool. 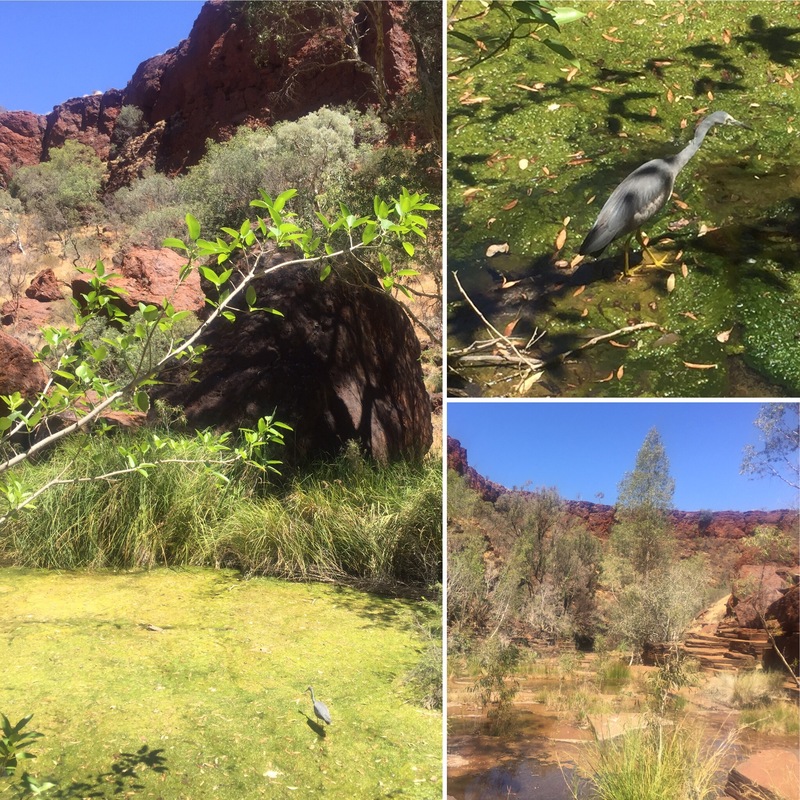 To get to the pool, we walked over a lot of flat slabs of rock that created giant ledges and steps along the gorge floor and over what was essentially a giant pond – complete with a beautiful grey-blue heron. 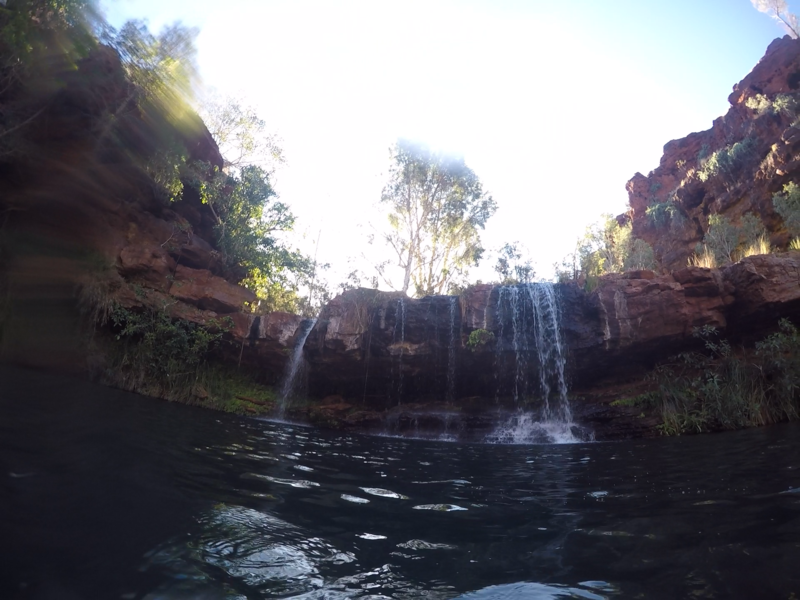 The circular falls were half covered with sunlight and had a dainty trickling waterfall going down the rock face. 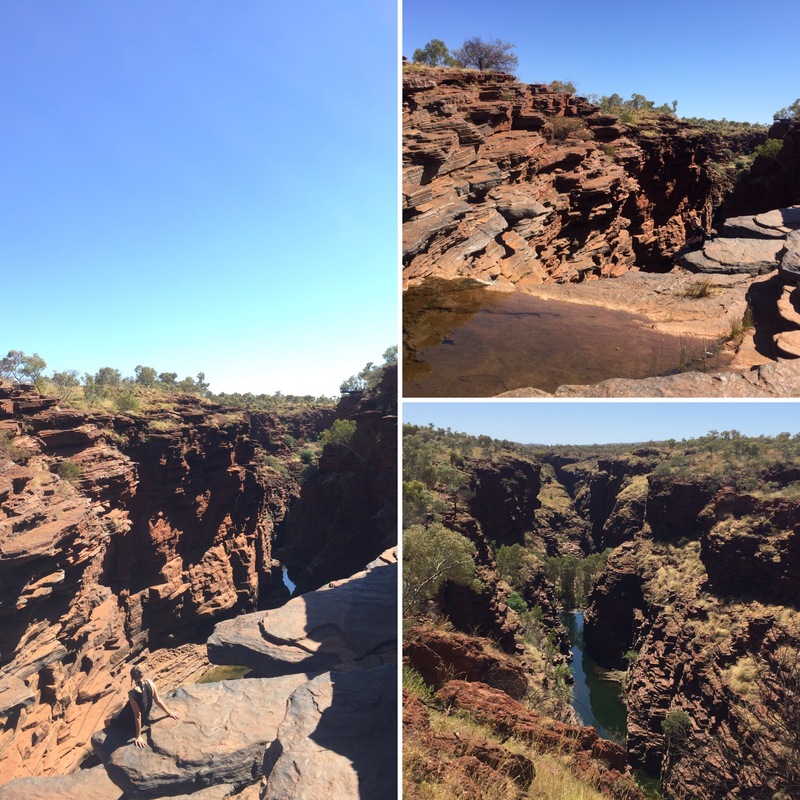 When you looked up, the gorge opened up and towered over the peaceful pool showing you brilliant blue sky. 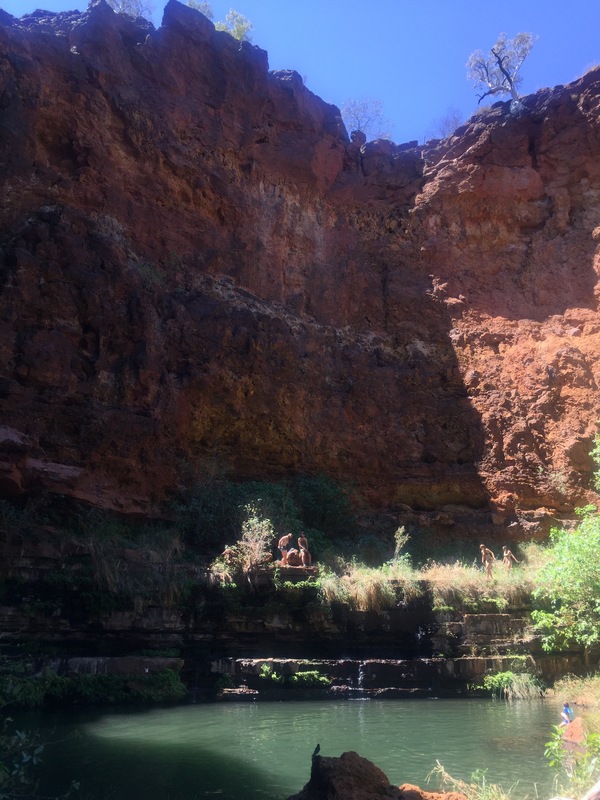 We sat here watching a group of travellers jump in and out of the pools before we braved the cold and swam in it ourselves – it was FREEZING. 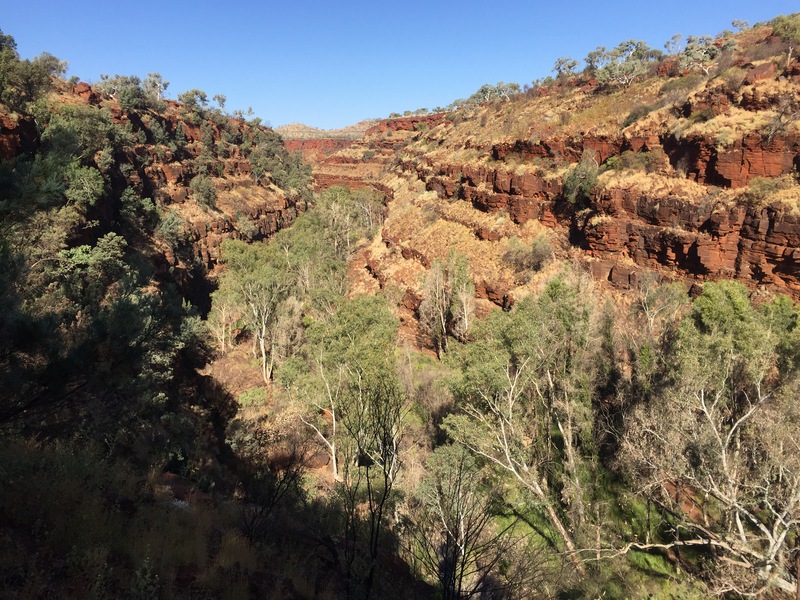 The top of the gorge (after climbing so many stairs) gave you stunning views of the rolling hills in the background and then off into the gorge below. 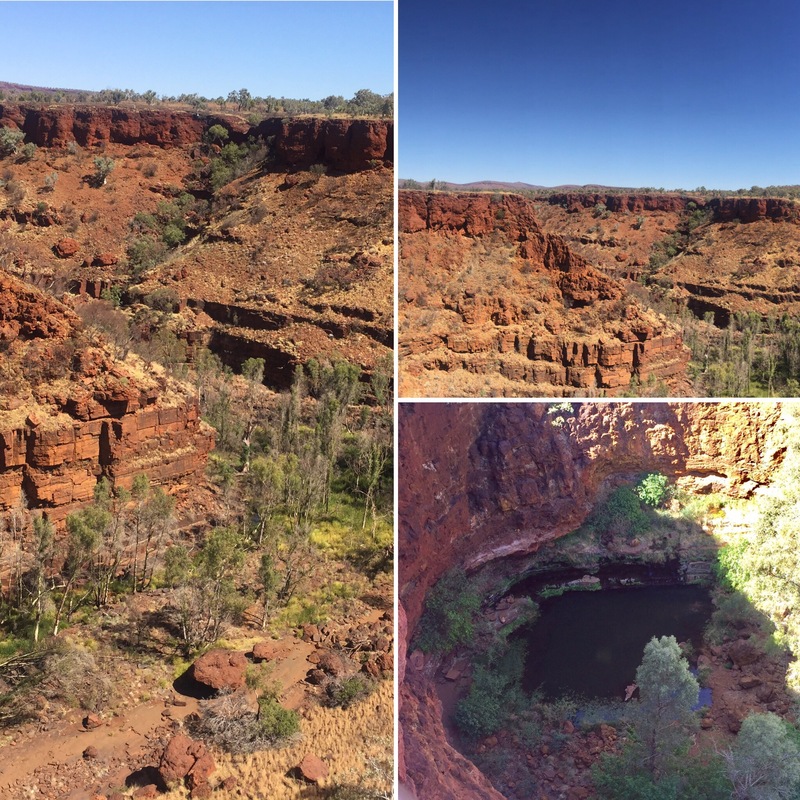 We could see the pool, still and silent, below us and could see the dense greenery running through the gorge back to Fortescue Falls. 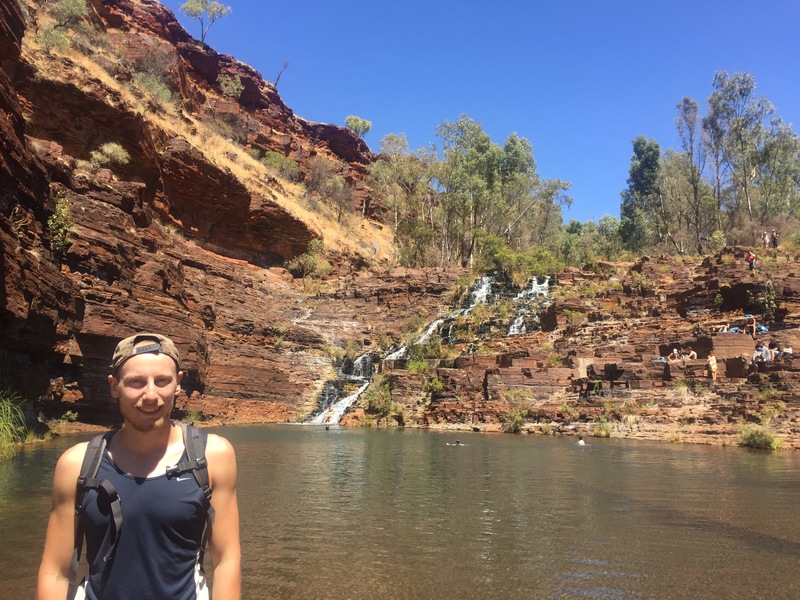 The walk along the ridge didn’t take very long and we spent the last couple hours of daylight relaxing back by Fortescue Falls. It was a great day and so lovely being surrounded by such beautiful scenery. 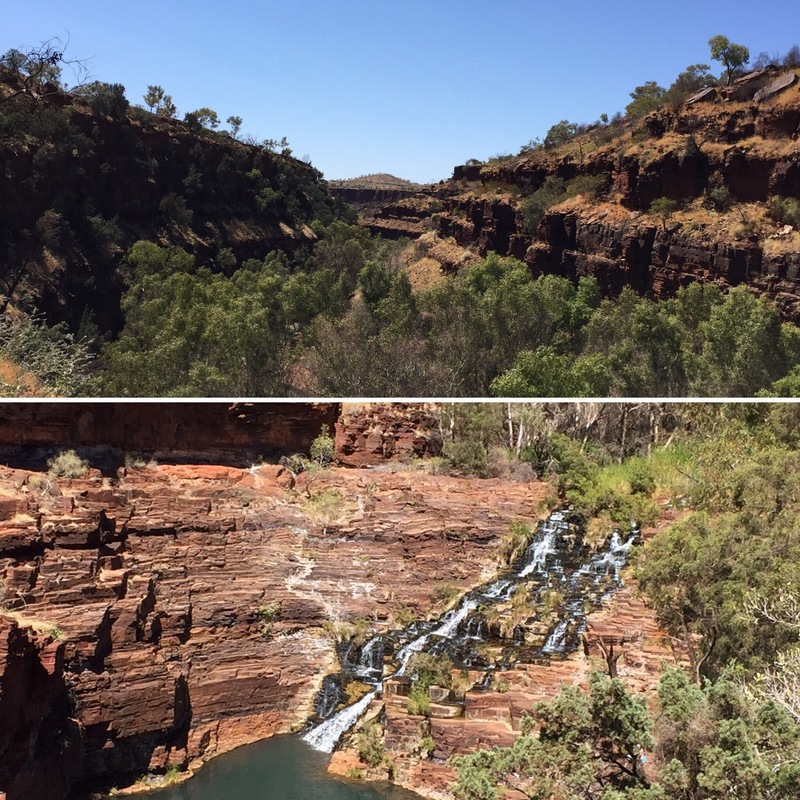 We hadn’t expected the national park to be as beautiful as it was and were so happy to have given ourselves plenty of time to explore it – it made us excited for what we had left to see! On our last full day in the national park, we made sure to pack a lot in. Our first stop was to Joffre Falls lookout. The water in the river below was incredibly clear even from the height we were at. 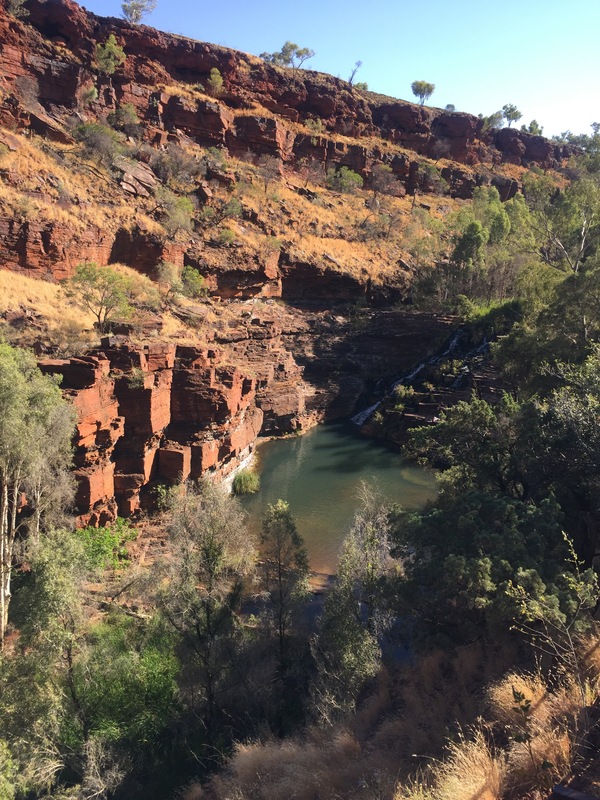 We decided that it looked so good that we would come back here on the morning we were leaving be national park to climb down into the gorge to the waterfall. 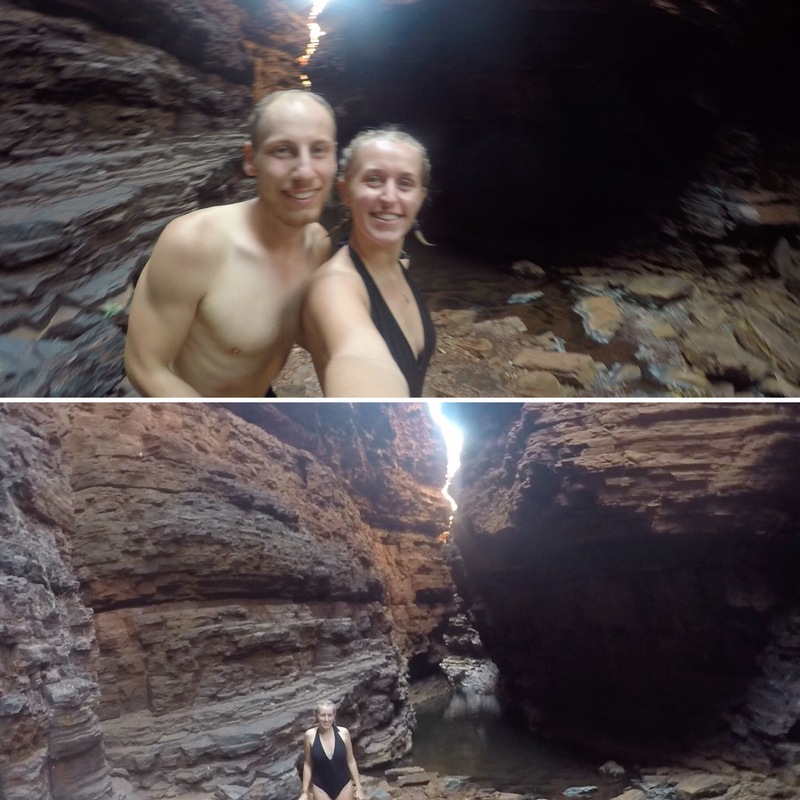 Our plan for our last full day though was to go to Kermit’s Pool in the Hancock Gorge. 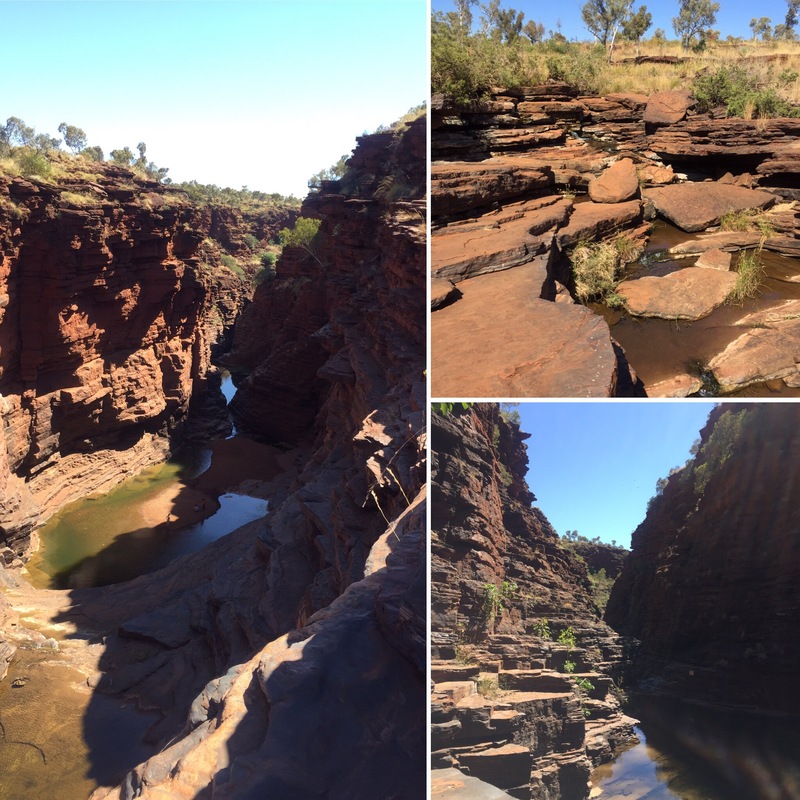 The gorge itself was very pretty but the real attraction was to head along the gorge to the Ampitheatre which at some points meant wading through some water. This wasn’t very deep and, so long as you kept your balance, you only got up to your shins wet. 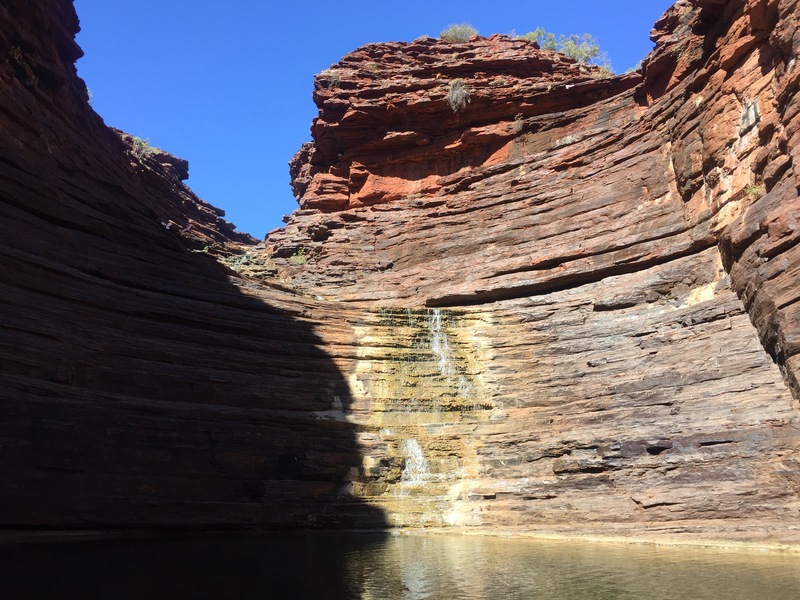 Once you have navigated this you have the option to either scramble the sides of the rocks or wade/swim in the water below to reach the amphitheatre. 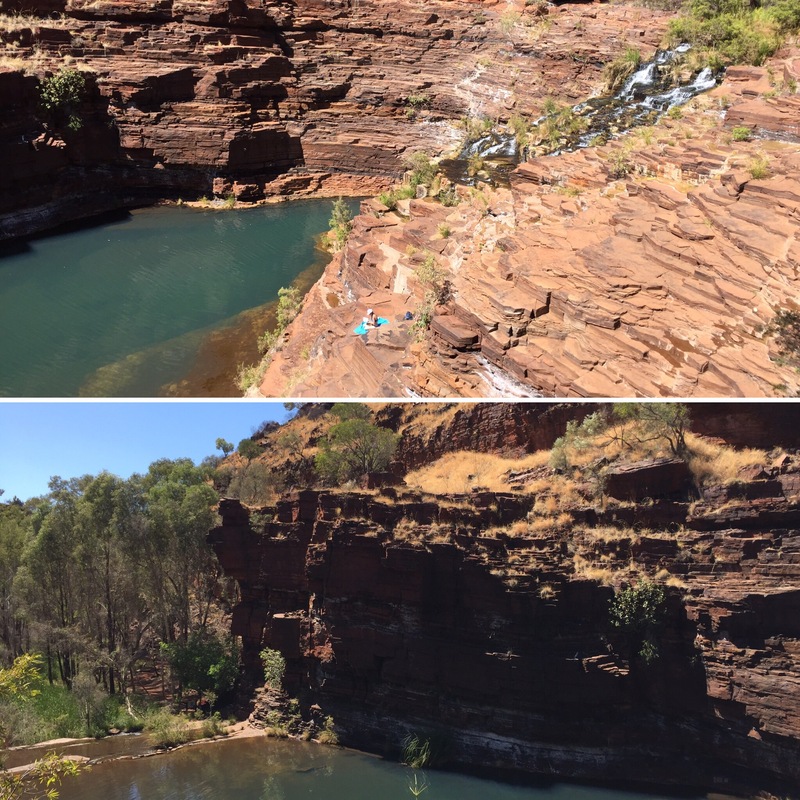 We did both: I swam, Niall clambered. I was in my swim stuff and it was a sunny day so, in my eyes, swimming was the easier option. 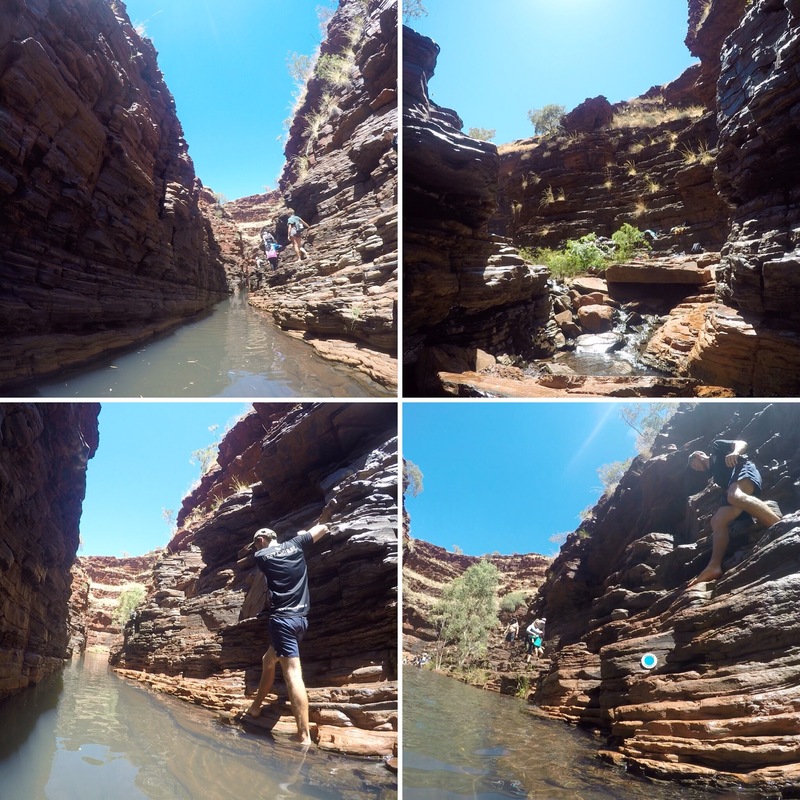 The water was cold but I got used to it pretty quickly – the climb did look fun though! The amphitheatre was given the name because of it’s shape. The rock slopes upwards in a curved formation and really does look like an ancient amphitheatre! 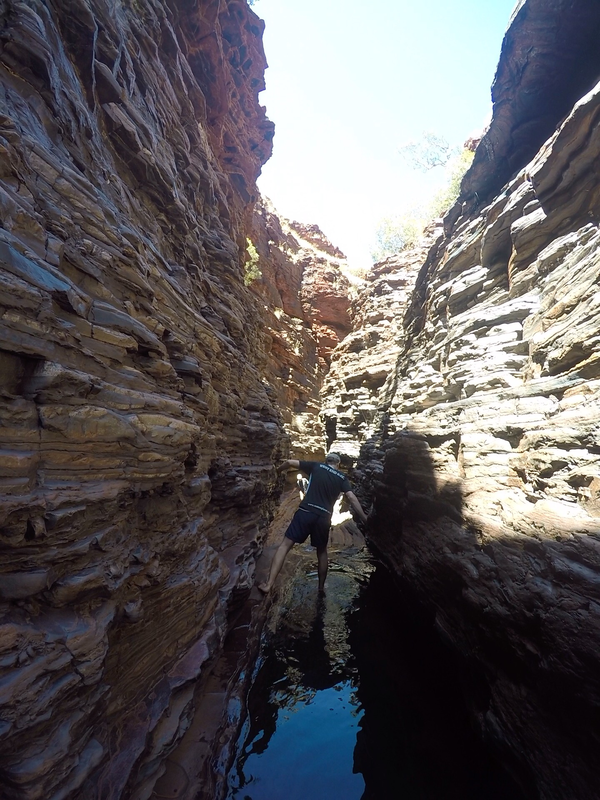 Passing through this crack in the rock led us to Kermit’s Pool. This is where I had my issues as pretty much a few steps in I slipped (for the second time in two days). I landed on my bum and slid down a lot of rocks. 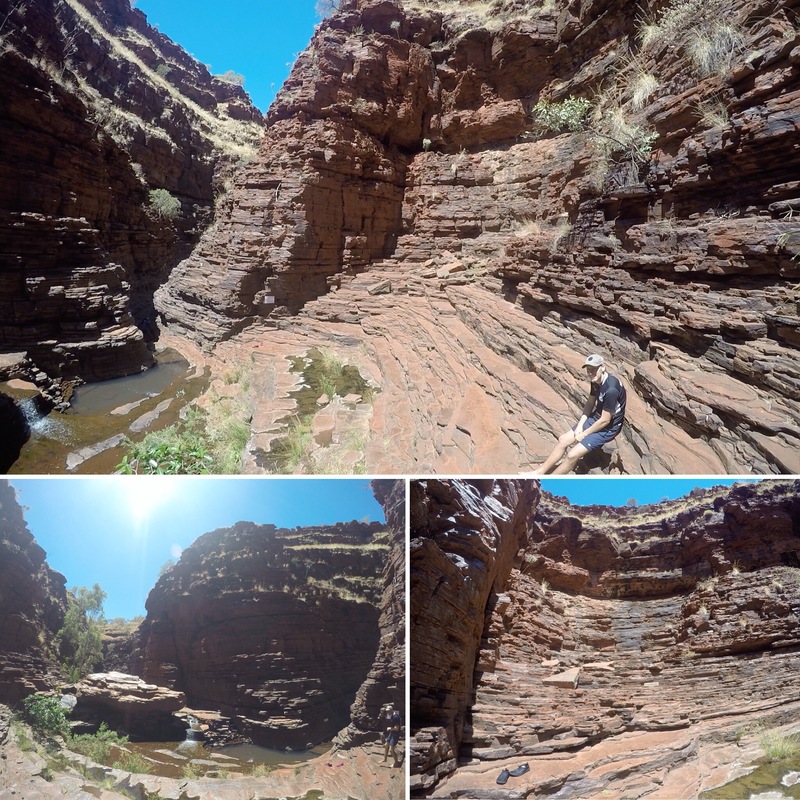 Luckily for me, the rocks were smooth and so aside from the bump when I hit the ground, it was a relatively smooth fall and I didn’t cut myself or bang my head (phew!) 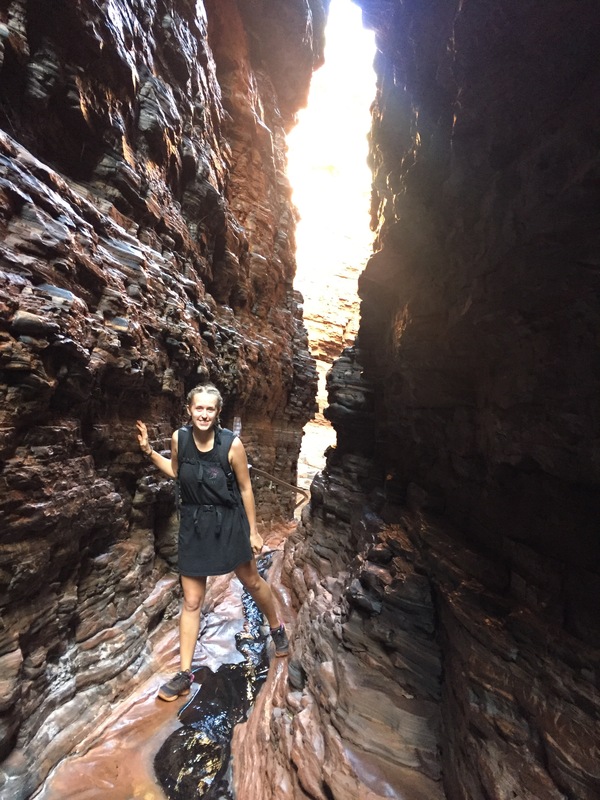 The biggest issue I found from falling over was the knock to my confidence and I didn’t trust my ability to grip the ground at all for the rest of the time in the national park. 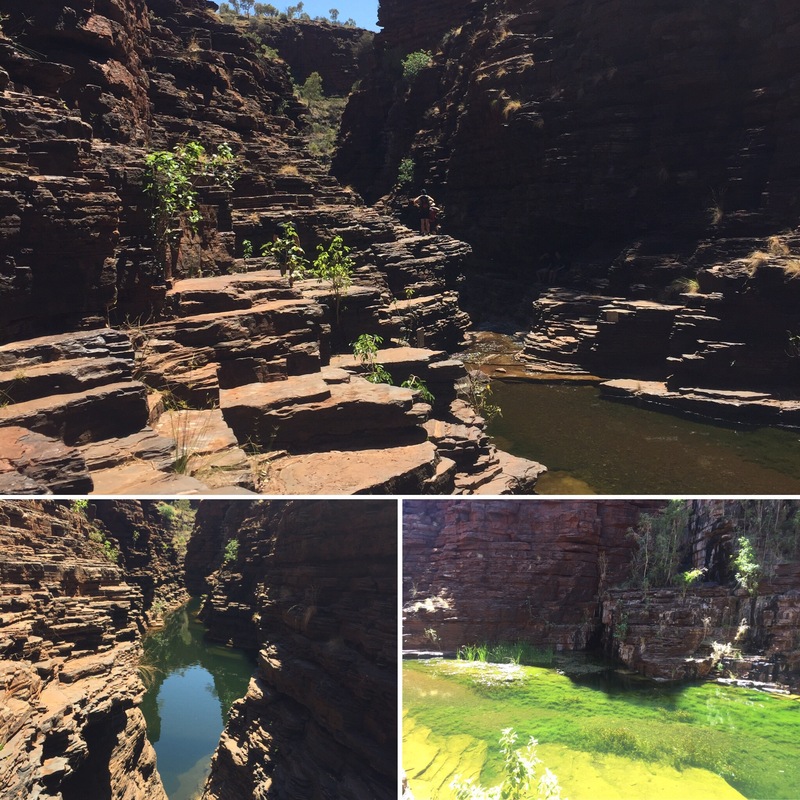 Kermit’s Pool was a beautiful little pool tucked into a narrow part of the gorge. It carried on a lot further than we were allowed to go (for safety reasons) but we did see some people in helmets with ropes and rubber rings going down further which I imagine was a lot of fun! 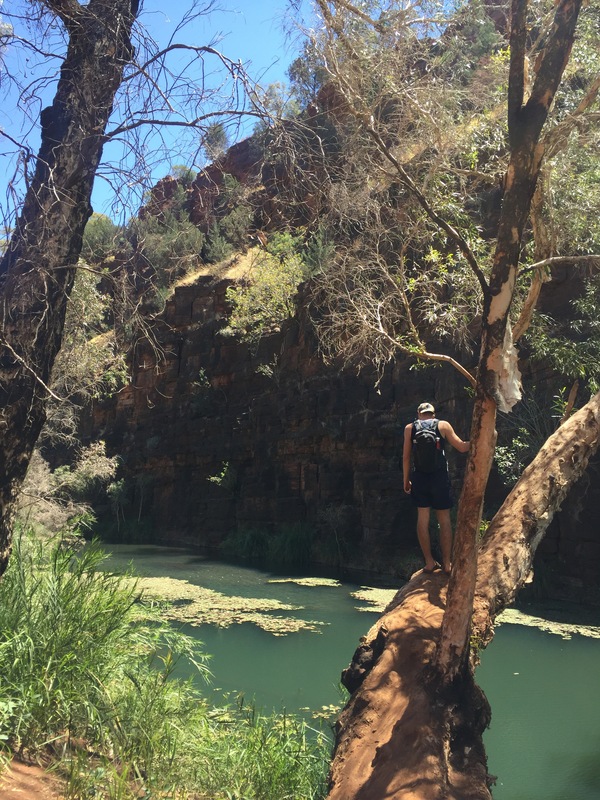 It was a lot easier getting back out the way we had came – maybe knowing that we had already done it once before helped and it was in no time that we were back out and walking out of the gorge. 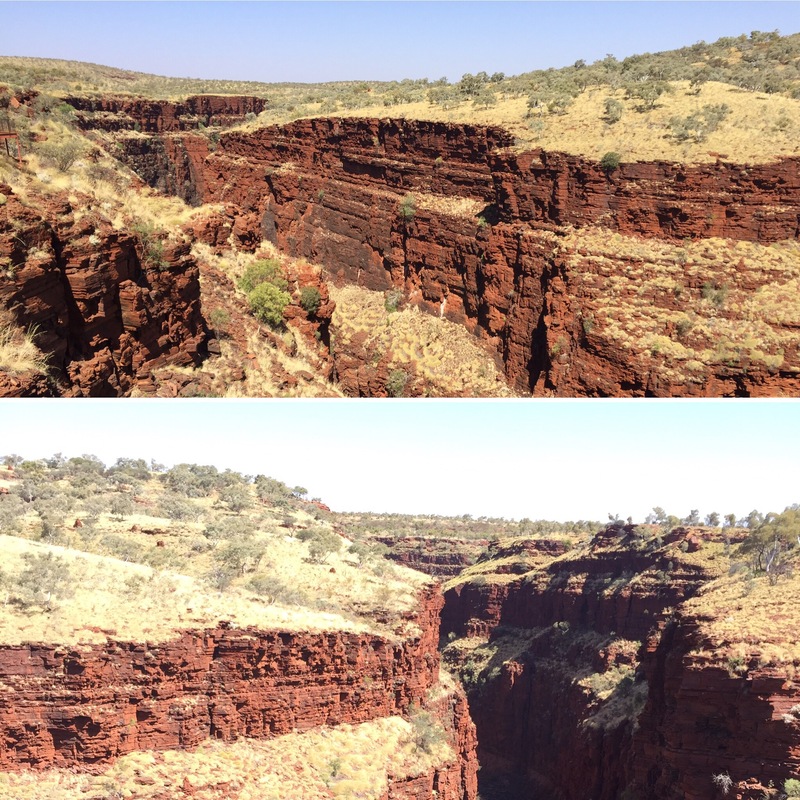 Our next stop of the day was to Oxer lookout which gave us great views over the gorges in the national park. This was also very near to the route to Handrail Pool where we would be going next. Handrail Pool has its name as you need to use the handrail (and stepping stones built into the rock) to climb down to the pool. 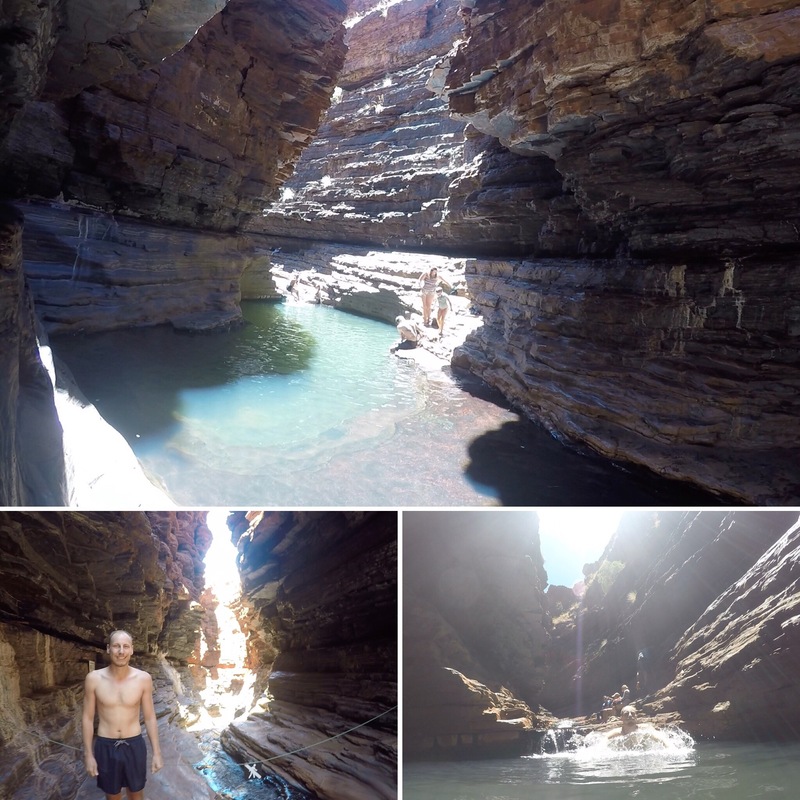 The route took you through a beautiful leafy gorge and then a narrow passageway between the walls of the gorge. The walk was fun and, thankfully, didn’t involve slippery surfaces so I didn’t have to worry about falling over! We were really lucky when we arrived to the pool as some people were leaving which meant we had the pools completely to ourselves for around five or ten minutes. 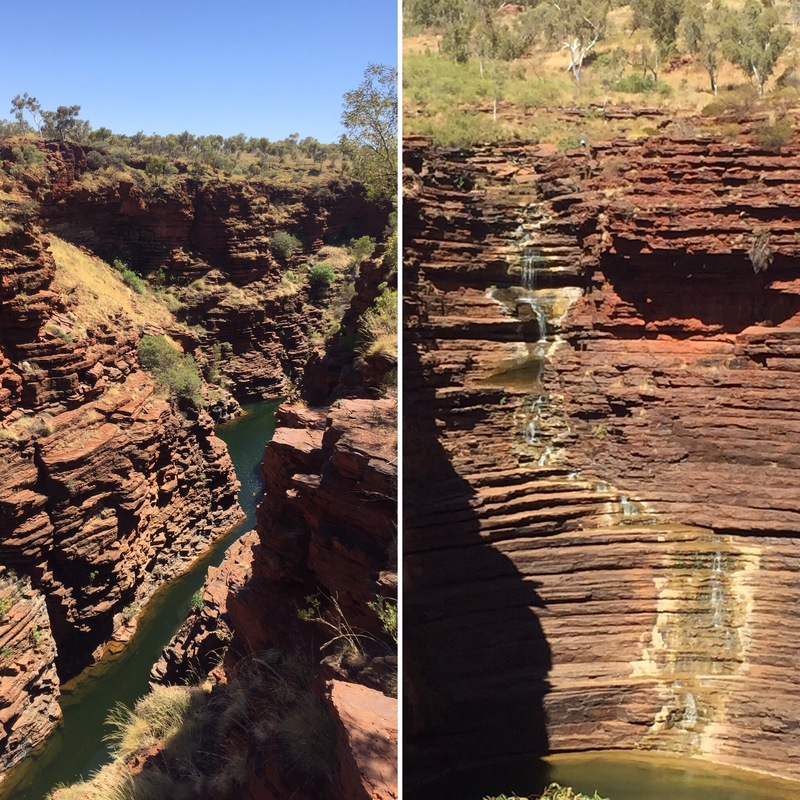 The water was really reflective and was set deep into the gorge with only some of the pool being exposed to sunlight at the time of day we were there. After a while we decided to brave what we knew was going to be incredibly cold water. Niall went in first and I took a bit longer as I foolishly started basking in a sunny spot on the edge of the pool, making the water feel even colder. 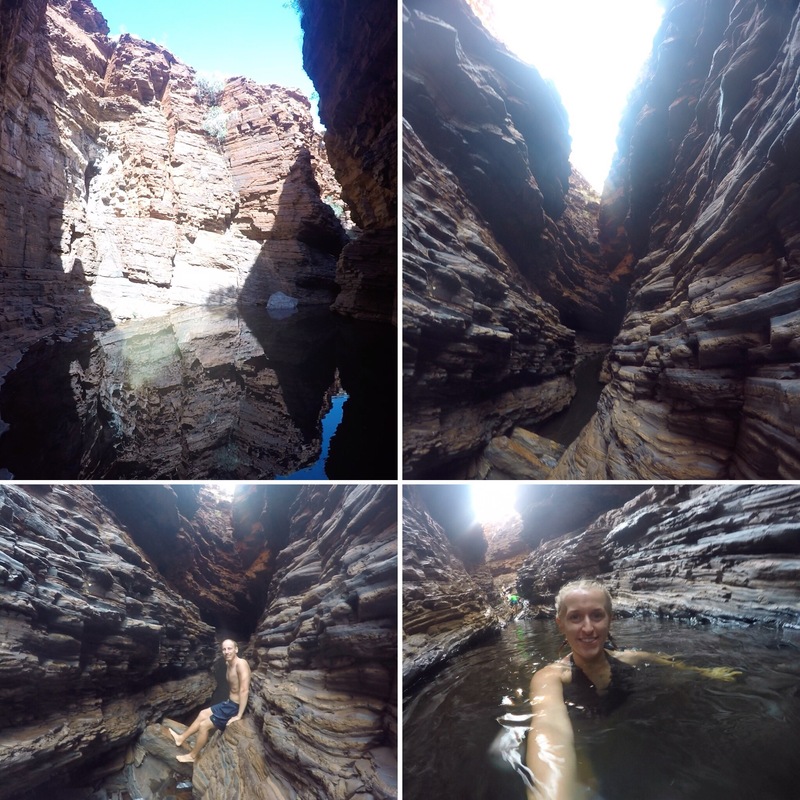 The water was cold but we braved it and went exploring through a narrow exit in the main pool down a smaller river section. I realised how cold the water was when we were heading back to the main pool and we were shivering and my teeth were chattering. I don’t think either of us had expected the water to make us so cold and so we quickly got out, dried off and warmed up. 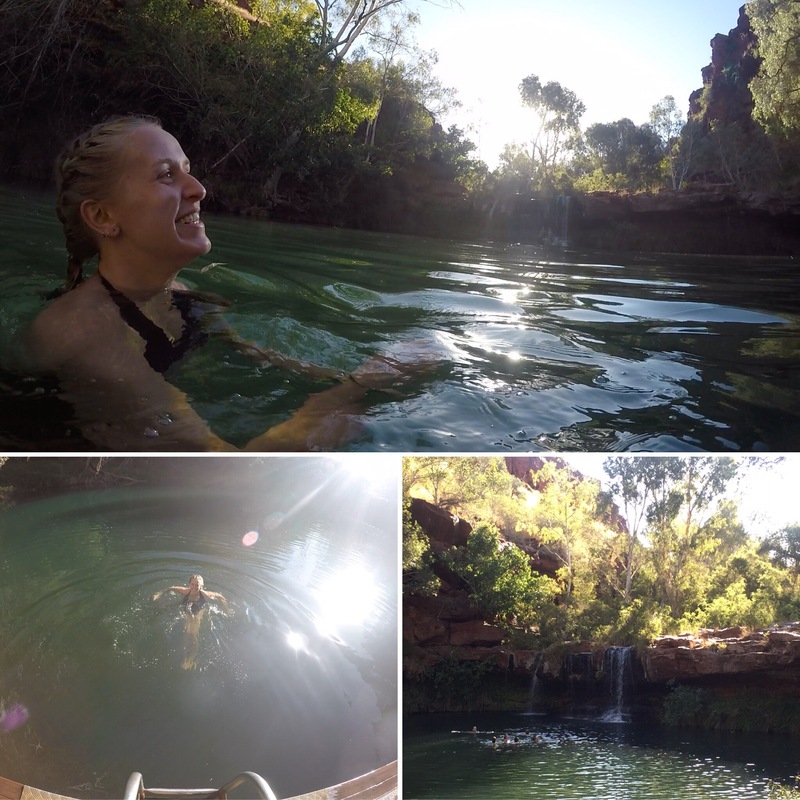 It was so good getting to spend time in the pool, especially when no one was there – a rarity with tourist destinations! 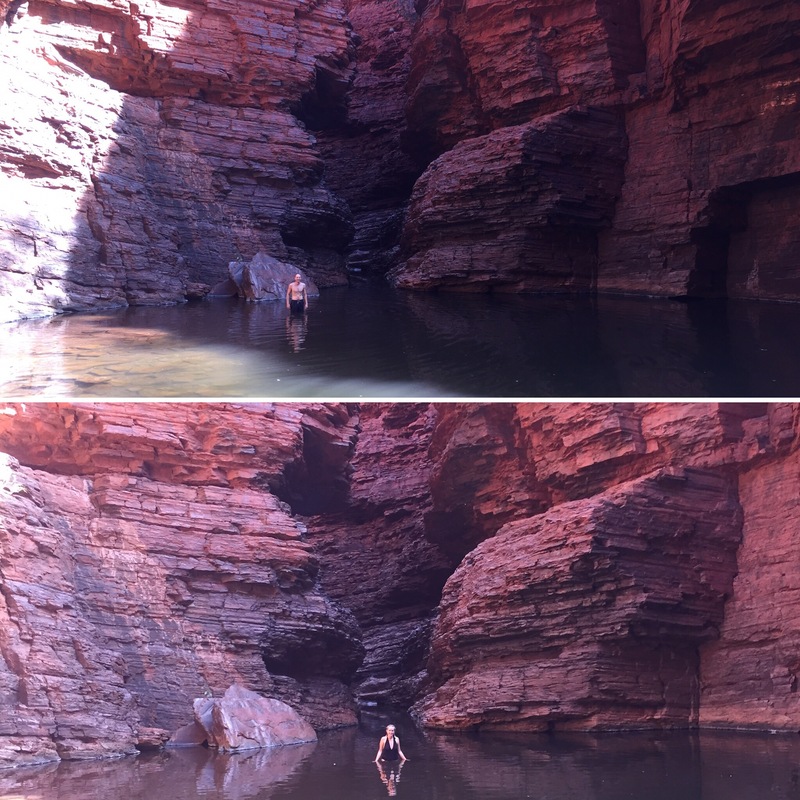 We had also made sure to have a swim in every watering hole as we may never be back there again in our lives so didn’t want to have wished we had jumped in when we had the chance (you can always get warm again after all). After our final night in camp we got up and out early and headed to Joffre Falls which was on our way out of the national park. The climb down to the falls passed along the edge of the gorge giving amazing views all the way down to where the waterfall was. 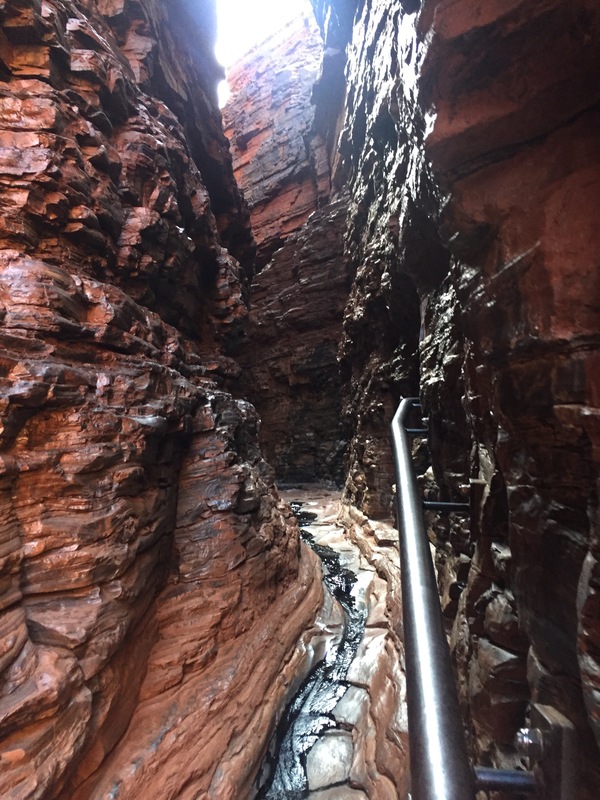 It always showed us how steep the descent was to the falls and we did end up having to climb down some sections that were pretty much vertical! 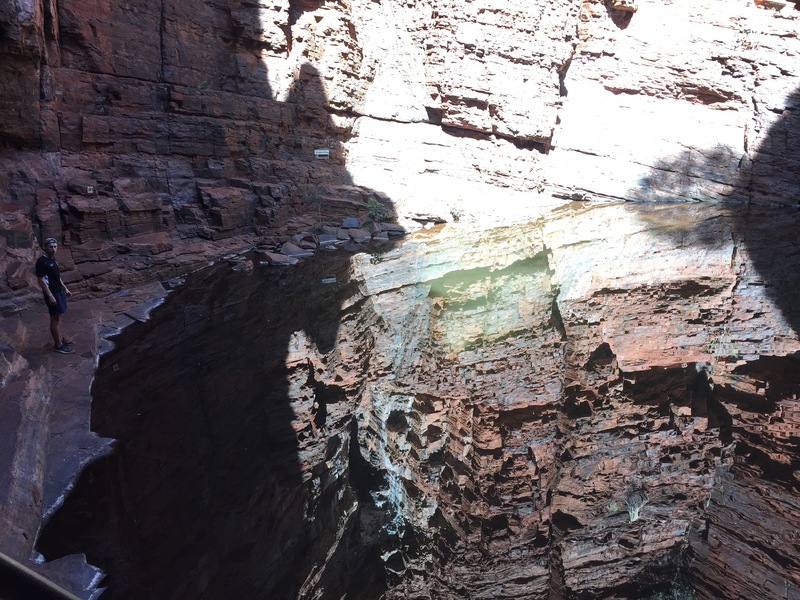 The falls itself were set into the end of the gorge and trickled down the rock race which was similar to Fortescue Falls in its layered structure. 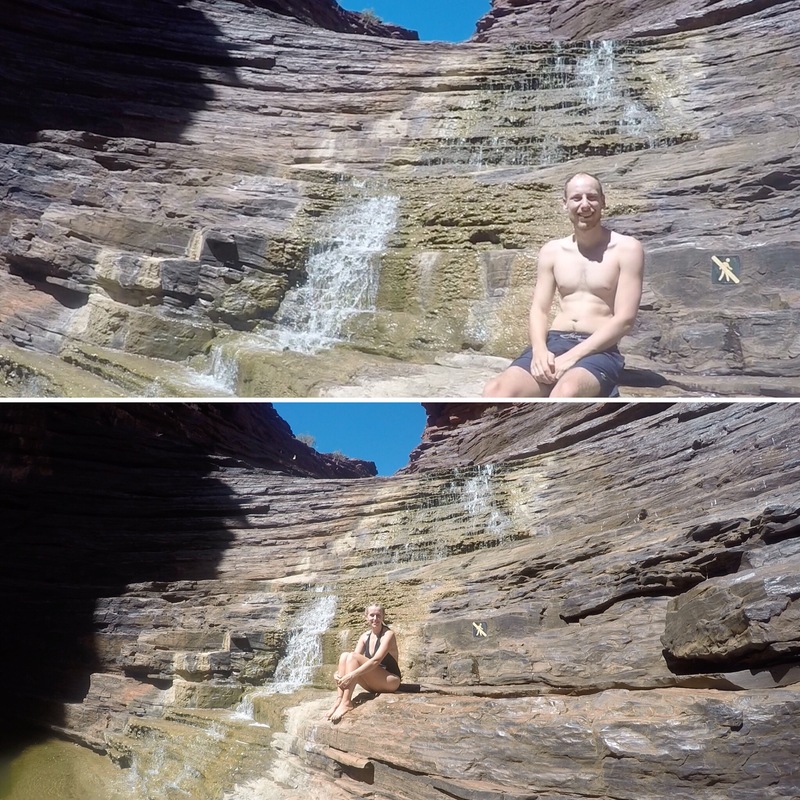 There was a shallow pool at the bottom of the falls which you had to cross to be able to sit on the rocks by the waterfall itself. 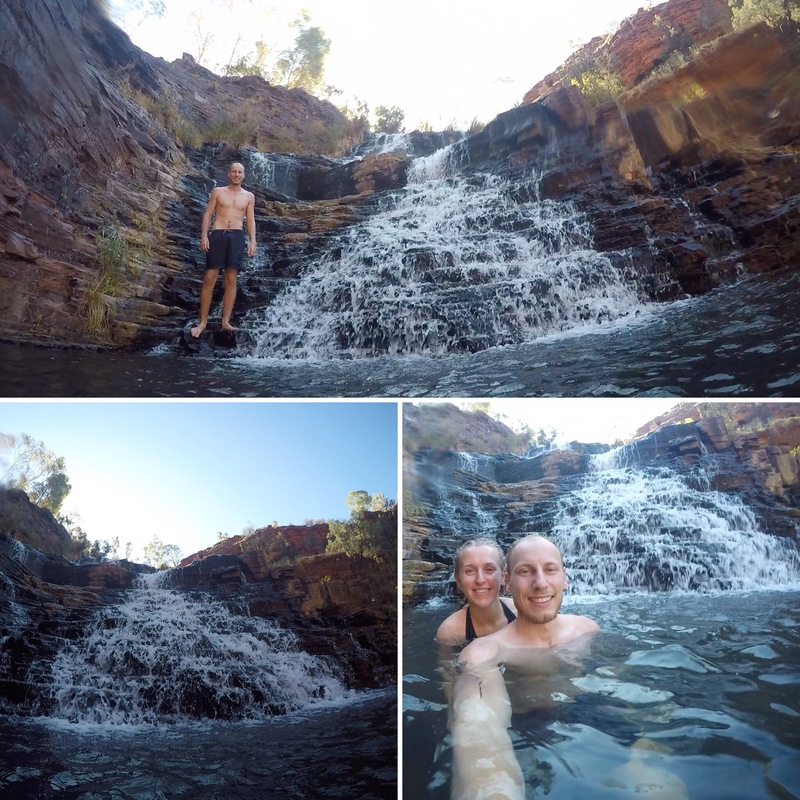 This water was probably the coldest water we went in – most likely because it was the morning – and we definitely didn’t stay in and swim around. We crossed the water to sit by the falls and then reluctantly crossed the water again to get back to the gorge walk. 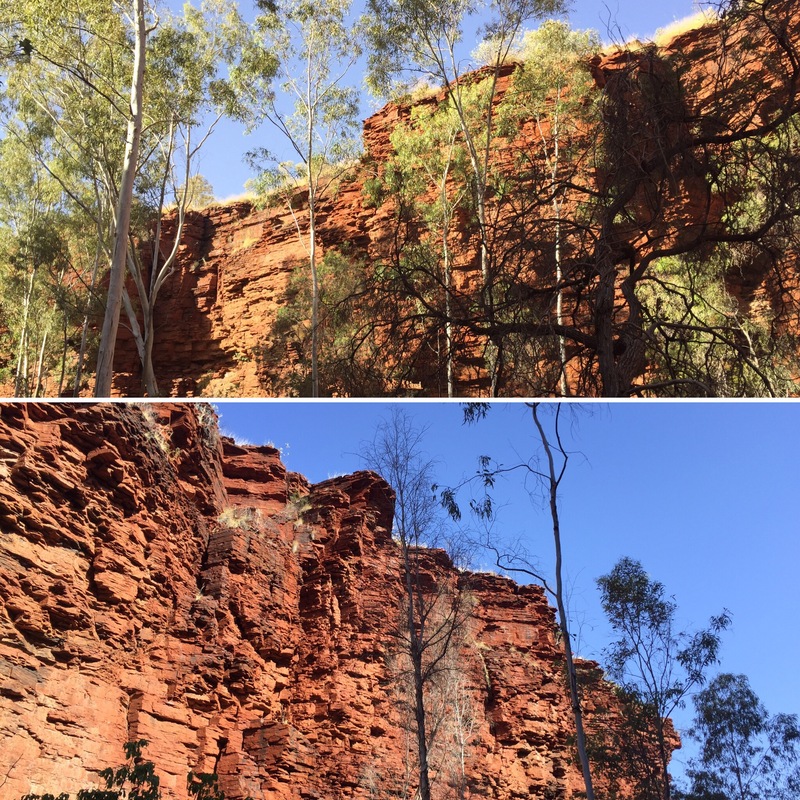 It was beautiful and had lots of cockatoos nesting in the trees and rocky nooks within the gorge. 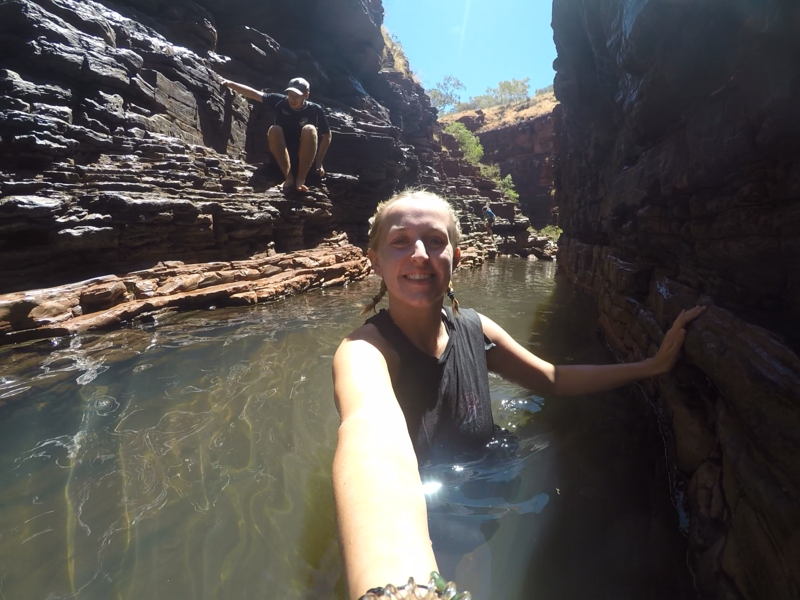 The Karijini National Park is an amazing place to visit as the amount of waterfalls and gorges gives you so much to do. 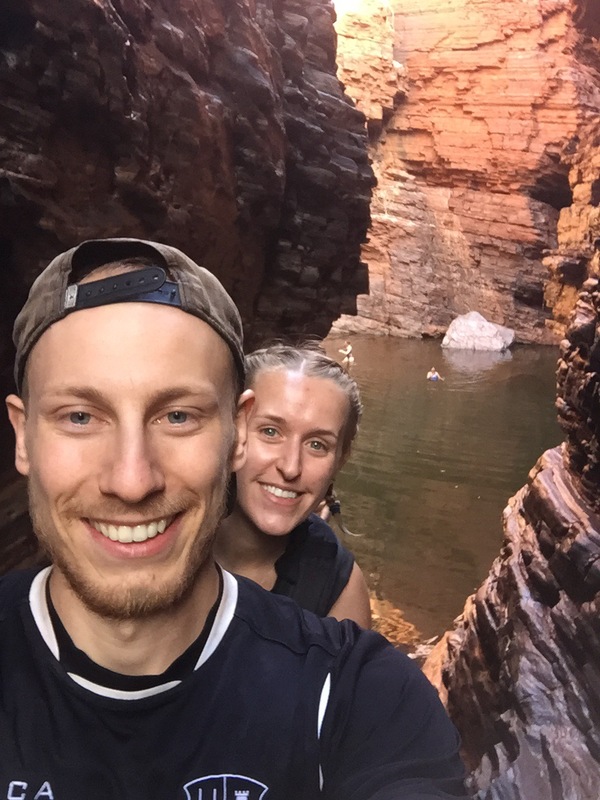 I would recommend the national park to anyone exploring the west of Australia and we’re so glad it was somewhere we were able to spend a good amount of time whilst on our road trip to Perth – it’s definitely a highlight for us both!